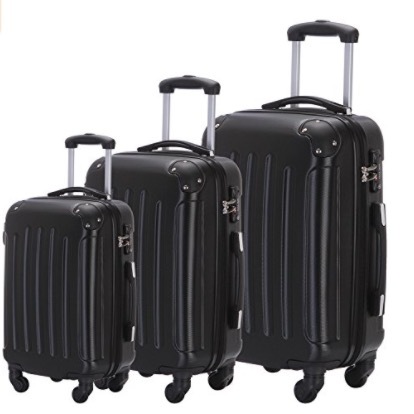 Eric Yian three-piece trolley suitcase luggage set is made up of three hard and solid units of 28, 24 and 20 inches. They are made of hardshell ABS material yet lightweight with spinner wheels underneath that rotate 360 degrees. You can get them in black (luggage 51), coffee- 79, golden- 55, purple, dark blue- 75 and silver- 71 colors. Despite these suitcases being light in weight, they are high quality and all have sturdy and durable construction. They are the expandable variety and suitable for different types of travel, leisure or business. Both the zippers and zipper flaps are solid and strong and they seem to be resistant to pressure and will withstand weight very well. They all have the strong aluminum telescoping handles with ergonomic design and are anti-slip and comfortable to hold. They include four large spinner wheels each, that are quiet and easy to maneuver in multiple directions. This way they are easier to handle no matter how short or weak you may be. They have a brand new, simplistic and modern design with a premium look and feel and look good in different color options, depending on your taste. With a solid and durable construction with the aluminum handle and sturdy ABS material and build quality, it promises to last long, many travels through the coming years. And so you can travel stress-free, whichever of the three you take with you on your trips. Eric Yian 20-inch cabin luggage weighs 5.8 pounds approximately and measures 20 x 13 x 9 inches, the 24-inch weighs 8.1 pounds with measurements of 24 x 16 x 11 inches and the largest 28-inch suitcase weighs 9.7 pounds and 28 x 19 x 13 inches. 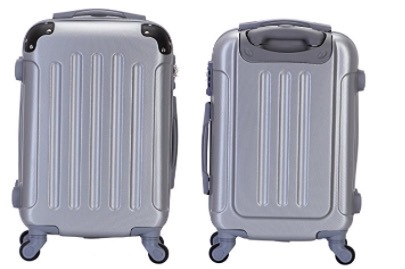 The smallest 20-inch trolley case meets the cabin luggage allowance of airlines in the US, according to IATA standards. They have spacious interiors and great zippered pockets for your travel essentials and small valuables. They can be nested easily into one another for easy storage purposes and that is how they get shipped in the first place- small into medium and medium into large. You will get two nice gifts with your purchase in the box, three good quality luggage covers and three luggage tags with random colors. You can put your name on the tag and lock it for security so the luggage handling staff can not get into it. They include the TSA-approved firm coded locks which are easy to set. They are resistant to dirt and stains and are easy to clean, as you just need to wipe with a damp rag. At the current price level, it may be hard to find better value set of suitcases.